Now that GSoC 2016 comes to its end, please allow me to update you on the powquty project. Despite some delays regarding the hardware, the goals set for GSoC 2016 have been reached. Here follows a picture that shows a compact demonstration for powquty. The picture depicts the set-up for powquty, which consits of a LEDE based wireless router, connected to the PC over serial interface, where a Termial session of the router is running. The oscilloscope is attached via USB to the router. On the router’s terminal session we see that powqutyd has been started, with the correspondent messages shown on stdout. These message show the calculated power parameters. Before running powqutyd you need to configure it. Powqutyd needs to read the measurement samples from the USB oscilloscope. The USB oscilloscope has to be plugged to the router before running powqutyd. The USB oscilloscope implements the USB Communication Device Class (CDC) device specification. This means that the kernel module kmod-usb-acm will recognize the USB oscilliscope once plugged and will create a tty device probably under /dev/ttyACM0. Depending on your setup this could be different. Check your system logs after plugging the USB oscilloscope to find out the actual path of the tty-device on your setup and adjust the path in the config file of powqutyd (/etc/powqutyd/powqutyd.cfg) accordingly. Note: if the tty-device is not set right the powqutyd will not start! Powqutyd will send the calculated power quality parameters using MQTT-protocol to an MQTT-broker. This means that powqutyd requires IP connectivity between your router and the MQTT-broker. Of course this is given if you set up an MQTT broker on your router itself, but this is not a requirement, as long as the router has an IP connectivity to an MQTT-broker. For testing purposes we used mosquitto on the router as MQTT-broker. Depending on your setup you need to adjust the mqtt_host config option in your /etc/powqutyd/powqutyd.cfg accordingly. The mqtt_host config option is a string that could contain either the IP-address of the Fully Qualified Domain Name (FQDN) of the MQTT-broker. Note: at the current state, the MQTT-client implemeted by powqutyd uses the port 1883 with no SSL support. Furthermore the powqutyd’s MQTT-client is an publish only client, thus it will not subscribe and has no will. Nonetheless the topic under which the powqutyd’s MQTT-client publishes needs to be set. This can be done by adjusting the mqtt_topic config option in your /etc/powqutyd/powqutyd.cfg accordingly. It is possible to print the results messages that powqutyd sends to the MQTT-Broker to stdout. This can be set by the option powqutyd_print. If set to 0 (zero) powqutyd will not print the result to stdout. Running powqutyd: Once all the configuration above are done powqutyd can be started by typing: “powqutyd &” to your terminal. The following picture depicts the folder structure of the work done during the porject. First I had ported the library to a binary blob that can be used on the router. Next I ve implemented the MQTT-functionality. After that, I started working on the emulator, then I started working on the USB communication. For that I followed a trial and error approach, for which I used the folder called test to try out different things. Strictly speaking it is not needed at all for the software to compile and run, yet I kept it for future reference. For the USB comuication I implemented two solutions: One using libusb, and another one using virtual serial port (termios.h), since i wasn’t sure how will the USB oscilloscope will behave on the router and if any driver on the router will provide me with a tty device. luckily the kmod-usb-acm did so, thus i continued the project with the virtual serial port solution. 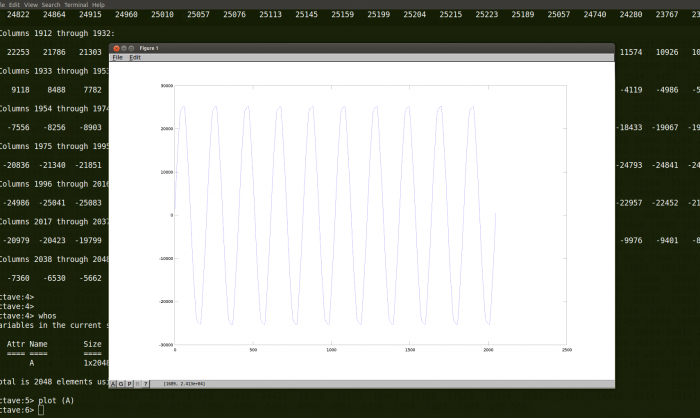 The picture shows ten sine waves corresponding to 200 ms, with 10kHz sampling rate, formed by 2048 samples. Yet as it can be seen the calibration was missing and the values were between +2500 and -2500. That is because the values (as seen in the background of the figure) where signed short numbers, and uncalibrated. (I used octave for plotting). After successful retrieval of the sampling values, I continued designing the software for powquty. I decided to use a multi-threaded approach with a Thread for sending MQTT-messages, a second for retrieving measurment samples and a third for calculating the power quality parameters. I included a ring-buffer as an interface between the retrieval thread and the calculating-thread. once all three component were integrated and working together I added the configuration (using libconfig) instead of hard-coded MQTT-Broker address, and hard-coded TTY-device …etc. At this point the powquty project has reached its first big Milestone where the basic functionalities set for the GSoC 2016, have been completely implemented. Nonetheless, please allow me to express my gratitude to my mentor, Dr. Thomas Hühn, for his outstanding support, and constant availability. Also great thanks are due to Freifunk, whose distinguished voluntary efforts – not only in regard to GSoC – made this possible in the first place. Last not least, great credits are due to Google for encouraging this innovative type of value creation. this is the final blog post about DynaPoint. Short recap: I created a daemon which regularily monitors the Internet connectivity and depending on that activates and deactivates the proper access points. That way the handling with APs would become easier as you already could tell the status by the AP’s SSID. I also created a LuCI component for it to make the configuration more easy. In the past weeks I was able to add some new features, fix bugs and complete the LuCI component. Especially the latter was really interesting and gave me some knowledge about how LuCI works. In the last post I mentioned that it’s better to verify Internet connectivity by using wget instead of just pinging an IP address. Consequently I switched from Pingcheck to wget. I also added an option to use curl instead of wget. With curl you also get the option to choose the interface for the connection. When you provide internet via VPN-interface you can explicitly check the connection of that interface now. The reason why I don’t use curl as default is because of curl’s rather large size. For some routers with only 4 MB of storage it might be too much. I also added an “offline threshold”, which will delay the switch to offline mode. So for example when you set the interval to 60 seconds and offline_threshold to 5, the switch to offline mode will be made after 5 cycles of checking (=300 seconds). So how does an example configuration look like? If you want to try out DynaPoint for yourself please visit https://github.com/thuehn/dynapoint for more information. Currently there is only support for one AP per state. In the next weeks I want to add support for multiple APs per state. Also I want to add support for more rules. At this time there is only support for one rule “internet”. I want to make this more generic and provide support for custom rules. 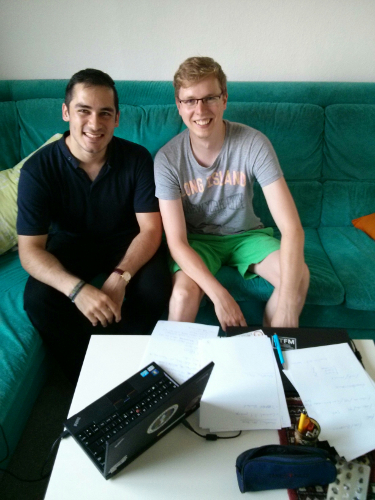 I want to thank my mentor Thomas Hühn for his excellent mentoring and great ideas during this project. Also of course thanks to Freifunk for letting me realize this project and thanks to Google for organizing GSoC. The sub-projects are background work for community projects. The mainline Google Summer of Code project is to develop a new firmware for routers, based on LEDE . The third point are seminars for enlightment of technical aspects of the Freifunk Community. First I would like to list up all sub-projects and their status. The first of the sub-projects is the hoodselector. For a final explanation of this construct I would like to explain the following points to give you a good understanding of this concept. On the Nordwest Freifunk community we had one big problem. Due to the batman-adv management traffic, the network setup is not really scalable. This problem also exists on many other communities where they have thousands of mesh routers inside one single network. If there are too many routers inside of one layer 2 network the batman-adv management traffic will flood this network and make it useless. The name describes the region depending on its geo coordinates. For example, if you create a hood over the city Oldenburg(Oldb) (Germany), a good name could be Oldenburg or ol as short. Every name has to be unique inside a hoodfile. Redundant names are not allowed! The bssid will be set for the adhoc wireless interface. This is the main part of splitting the layer 2 network. Inside the bssid there is the IPv4 sub-network encoded which is in use inside the hood. In the above json part the following IPv4 sub-network is encoded “10.18.160.0/21” dec to bin => “0000’1010 0001’0010 1010’0000 0000’0000” bin to hex => 0x0A 0x12 0xA0 0x00 hex to mac => 02:00:0A:12:A0:00. Therefore the bssid should also be unique. The defaulthood boolean is only true on the default hood. The default hood doesn’t have coordinates and is the inverted form of all other hoods with geo coordinates. One VPN server should be used for one hood only! If two hoods have the same VPN server, batman-adv will loop them over VPN. Each hood can have any number of rectangles inside the boxes array. To make your life a little easier you can use the hoodgen and source to write your json with the required informations. This is a simple web visualization tool to plan hoods and generate the right json format for the hoodfile. This tool has been written by Eike Baran. Big Thanks to him for this helpful tool! It is a software that creates decentralized, semi automated ISO OSI layer 2 network segmentation for batman-adv layer 2 routing networks. This program reads the geobased sub-networks called hoods from the above mentioned hoodfile. The decision of choosing the right hood is made on following points: first, the hoodselector checks, if the router has a VPN connection. If it has, the hoodselector then checks, if a static geoposition was set on the router. If not, it tries to get a position using wireless based localization with the so called geolocator. The geolocator  is a software which makes it possible to receive a position based on wireless networks “seen” around. These informations will be sent to the openwifi map project . Knowing the position of the router the hoodselector can find the right hood, because each hood is defined with geocoordinates. If the Router doesn’t have a VPN connection e.g. as a mesh only router, the hoodselector triggers a WIFI scan and searches for neighboured mesh routers in other hoods. If there is an other router with a different BSSID but with the same mesh SSID, the router chooses it’s hood based on the neighboured BSSID. I got much positive feedback from many other Freifunk Communities. Someone even created a integration request issue for gluon . Gluon is a framework based on openWRT and is very popular in the Freifunk community . Before I will send this as a patch to gluon there remains one last urgent issue . The current hoodselector is not able to handle mesh on LAN or WAN connections. So there is still a potential point of failure. Because persons who are not familiar enough with the hood-networking concept can accidentally interconnect hoods over the mesh on cable functions. I plan to fix this problem up to mid of september. When this issue is closed I would like sending patches for integration to gluon. Other issues can be found here. 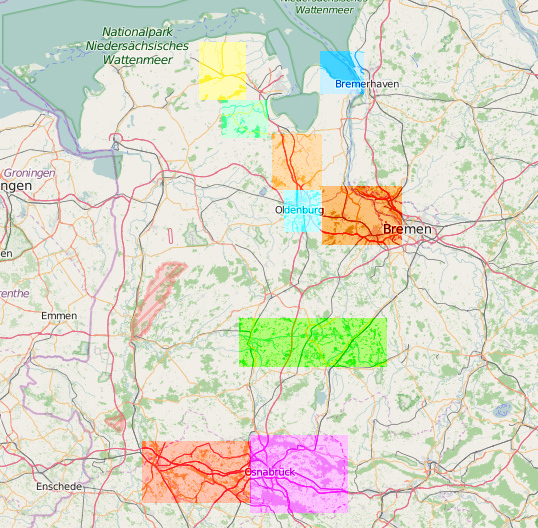 On the Nordwest Freifunk community we currently have 10 active hoods including a default hood. That is a special hood where all routers will connect to, if they are not able to choose a hood, including also routers there out of ranges from other real hoods. After the last 3 months we can safely say that the setup works. Commits can be found here All currently active hoods can be see here in this picture. As next I would like to tell you about the second sub-project as a prework for the mainline project. In that part I work on a proper workaround with the continuous-integration (CI) system of Gitlab. As I explained in the midterm evaluation, on our Nordwest community we started automatically building of nightly testing firmware images for our community firmware. The CI works now with a dynamical multiple core build processes and auto generated architecture targets out of source. At the moment it is not possible for Gitlab to handle high verbose inside the web-engine while the build process. I discussed the problem with the gitlab team and open an issue . The CI builder is very helpful for the developing process of the monitoring drone. Here you can see the result for the local community image and for the monitoring-drone . The buildscript is mainly a bash script for a humanly working with this buildroot. In other words it is an abstraction from the LEDE build ENV. Inside the BSP directory are all necessary architecture specific informations. BSP means Board-Support-Package. Also inside this directory are default informations like the shell banner system configs and so on. The community directory includes community specific configurations, similar like the gluon siteconf . Currently there are only two config parameters inside: first the “AP SSID” to set a default SSID with witch WIFI network should the monitoring-drone connect and the second parameter, the “AP BSSID” to set a node specific BSSID in case if more than one router with the same SSID is present. Then the monitoring drone is pinned on one specific node. This config parameter will be dropped in the future because it is not really effectively if a default BSSID is set . In future I plan to configure thous parameters over an extra web interface. – two lectures about Freifunk technical aspects. On the first hacking session at the 28. may 2:00 PM we created video recordings of the two lectures, you can find them here. The next hacking session were failures because of Clemens and my exams. In future there will follow other streams about tecnical aspects of Freifunk. For the hoodselector, I plan to close up the last urgent issue that I mentored in the above for the migration into gluon I also started prework on gluon for this. One part was the implementation of a sequential code minifying process at compile time . Also some other issues are still open so I will continuing the work on the hoodselector. For the monitoring firmware they currently is just configurable over ssh. A web interface should follow soon and also a plugin system for community specific monitoring data requests. 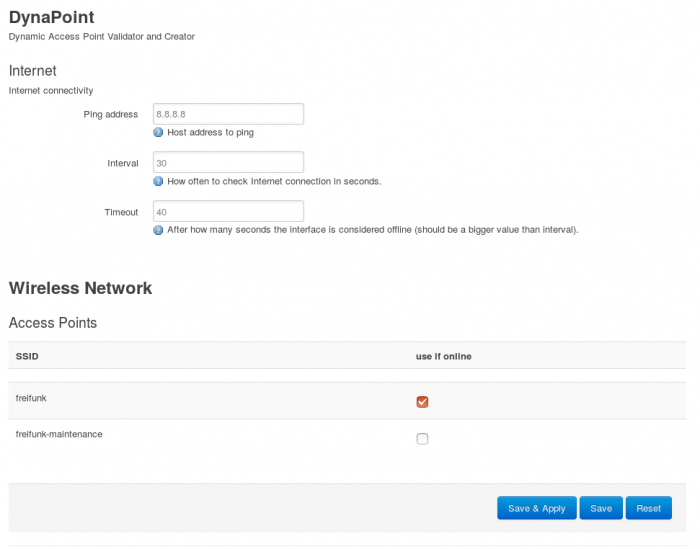 SWOON: Simultaneous Wireless Organic Optimization within Nodewatcher – Final steps. This blog post concludes the work I did during the Google Summer of Code 2016. Spending the summer on nodewatcher was a pleasantly laborious exercise. Although my proposal concerned a development of a new algorithm, I realized that I also had to prepare various other components so that the algorithm would work. I started by sketching a short plan of different components I had to integrate for my algorithm to work. To remind the readers, SWOON is an algorithm for an efficient allocation of wireless frequencies in a densely populated area where many wireless access points interfere with each other. Before any work could begin, I had to install a local version of nodewatcher. I did not want to interfere with wlanslovenija’s mature network and I needed a small network of my own to run these tests. To find such a network, I collaborated with a non-profit organization based in Berkeley, California. They provided me with access to a building outfitted with more than 10 wireless access points. The wireless access points in this testbed are extremely diverse. They come from various manufacturers and not all broadcast on the 5GHz band. This allowed me to work with issues unique to community networks: software has to be built ground-up to be extremely modular and it has to support a diverse range of equipment, since there is no central planning authority. I started with writing the data collection module, on which I have reported in my previous blog posts. Once I was able to work with the data, I worked on a different algorithm which detected rogue nodes in networks. This is especially useful for network maintainers who now have information on which nodes are most harmful to their network. They can now significantly reduce interference by working together. Algorithms on this scale have to be extremely efficient: I derived a complexity bound of O(E * log(V)) where E is the number of edges and V is the number of vertices in a graph. This allows the algorithm to scale all the way to wlanslovenija’s network or more, as it is almost linear. In order to achieve such scalability and efficiency, I had to peruse state-of-the-art graph theory research and utilize complex data structures (the one I used is called a disjoint-set data structure) to quickly order datasets in accordance with our needs. I then moved on to the main algorithm, which took weeks to even rigorously define, let alone code up. I first considered implementing the Beigel-Eppstein coloring algorithm, which is known to run in ~O(1.3^n) time, but the complexity of the algorithm rendered it impractical. It relies on 19 different subcases which are iteratively used to simplify the constraint satisfaction (CSP) instance. Instead, I reverted to a custom implementation of a state-of-the-art greedy approach, which had to be modified from the source code of NetworkX, a leading open-source graph manipulation package. I devised a custom way of ordering the nodes in a graph to correctly prioritize wireless access points. The algorithm starts with looking at all the ‘neighbors’ (other nodes your radio detects) and computes the ‘busyness’ of each frequency band. We then minimize joint interference through the algorithm. We observed an interesting property when running this algorithm on our wireless testbed. Most frequencies were moved to minimize interference, but some got worse. At first, we thought it was a bug, but we did eventually discover that some nodes must pick up more interference for others to remain noiseless. This perfectly coincides with our goal, which is to minimize the interference over all nodes, not every single node. One major problem with the algorithm is how unreliable ‘signal’ data is. We were thinking of coming up with a better metric to measure link quality instead of using signal strength. We were considering using the number of packet collisions instead. The modular design allows us to painlessly replace the metric without having to understand the entire algorithm. We also noticed openWRT’s iwinfo doesn’t provide information about channel widths of access points. Adding this data would allow more accurate calculations instead of assuming all channels are 20MHz wide. Finally, nodewatcher doesn’t yet have support for issuing node-specific warnings. I’d love to use such a warning to let a maintainer know that their node needs to change the channel. However, I am confident this algorithm will enhance our user’s experience. Tagged Community, GSoC 2016, nodewatcher, SoftwareLeave a Comment on SWOON: Simultaneous Wireless Organic Optimization within Nodewatcher – Final steps. The Google Summer of Code is almost over, so in this blog post I’ll give a overview over the targets I’ve met (and those I haven’t). All code in the first two repositories has been developed by me during the GSoC. The third link shows the work I’ve done to integrate a ECE backend into libuci. The Wiki at https://gitlab.com/neoraider/ece/wikis/home gives a good overview of the design and the usage of ECE and describes many features in detail. The pkg-ece package feed can be used to build and install the different components of ECE on OpenWrt/LEDE easily. This format is very simple: Each file (called “package”) has a number of sections (named or unnamed) of different types (this example from the “system” package has a single unnamed section of type “system”). These section contain options with single values or lists of values. UCI doesn’t have built-in validation. Frontends like LuCI usually validate the entered data, but as soon as the CLI client is used, no validation is done. In some situations, upgrades to default values should also affect the effective values; but only if the user didn’t change the values themselves. With UCI, this is not possible, as it doesn’t store the information if a value was changed by a user. Note that this is only the external representation of the configuration; internally, it is stored in a more efficient binary format. JSON gives us a lot of features for free: arbitrary configuration trees with proper data types. Existing standards and standard drafts like JSON Pointer and JSON Schema can be used to reference and validate configuration (the JSON Schema specification is simplified for ECE a bit though to allow more efficient validation on embedded systems). The quoting is currently necessary to make the string a valid JSON document; this may change in a future version. The whole configuration is saved in a single JSON document, but the specific format is not defined by a single schema; instead, each package can provide a schema, and the configuration tree is validated against a merged schema definition. The schemas also provide default values for the configuration. Adding documentation for the configuration options to the schemas is planned as a future addition and might be used to support the user in configuration utilities and automatically generate web-based or other interfaces. This gives only a small example for the usage of ECE, the abovementioned ECE Wiki contains much more information about the usage of ECE and the ideas behind it. In addition to the daemon and a simple CLI utility, I’ve developed libraries for C, Lua and Shell which allow to access the configuration. While there are still some features missing (some points for future work are given in https://gitlab.com/neoraider/ece/wikis/todo ), I think most of the missing pieces can be added in the near future. When I proposed my project for the GSoC, I didn’t aim at making it a full replacement for the current UCI system, at least not in the near future. While the possibility to move some of UCI config files into the ECE config database had been my plan from the beginning, my ideas for backwards compatibility didn’t go further than a one-time import from UCI to ECE, and one-way generation of UCI config files from ECE. After talking to a few LEDE developers and package maintainers, it became clear to me and my mentors that many people are interested in replacing UCI with a better system in the not-too-far future. But for ECE to become this replacement, a real two-way binding between UCI and ECE would be necessary to allow gradual migration, so configuration utilities like LuCI (and many other utilities somehow interacting with UCI) don’t need to be adjusted in a flag-day change. An incomplete design draft for this UCI/ECE bridge has been outlined in https://gitlab.com/neoraider/ece/wikis/design/uci-bridge . The code found in the UCI ECE backend repository linked above implements a part of this bridge (it can load “static” and “named” bindings from ECE into UCI, and commit “static” bindings back to ECE) and has been implemented as an API- and ABI-compatible extension to libuci. The development of this bridge has taken a lot of time (much more time than I had originally scheduled for UCI compatibility features), as the data models of UCI and ECE are very different. Of all points given in https://gitlab.com/neoraider/ece/wikis/todo , finalizing the database format is the most important, as any future change in the storage format will either break compatibility or involve some kind of conversion. When it is clear the format won’t be changed anymore, ECE should be added to the OpenWrt community package repository to make it easily accessible to all OpenWrt and LEDE users. After that, other points given in the TODO should be dealt with, but none of those seem too pressing to prevent actually using ECE for some software (but some of the points given in the first section of the TODO page would need to be addressed to properly support software that requires more complex configuration). Last, but no least, I’d like to express my gratitude to my mentors and all people in the OpenWrt, LEDE and Freifunk communities who have helped me develop ECE by giving guidance and lots of useful feedback, and to Google, who allowed me to focus on this project throughout this summer. please allow me to update you on the progress if the powquty Project within Google Summer of Code 2016 at Freifunk. Herein I will give a short update about the progress of these functionalities. For this project we are using an off-the-shelf USB-based oscilloscope “WeSense” from the company A.Eberle. The oscilloscope provides real time samples of measured voltage from the power plug via USB bus, using a binary protocol and a sample frequency up to 10kHz. Initially the oscilloscopes USB bus supported the host functionality only. Hencethe router would need to act in USB device mode, which is a rather unusual mode to be supported by todays WiFi router platforms. To overcome this limitation, aforementioned company agreed to provide us with another hardware implementation that implements the USB device functionality with optional five volts power feeding functionality. The new hardware is expected on my desk in mid July. As a counter measure for this delay, we started implementing an emulator, that locally generates a signal-samples, which are then organised in packets as similar to the binary protocol. Regarding the calculation of the power quality parameters functionality, we successfully ported the power quality library (in Ansi C) from A.Eberle to compile and run under Linux LEDE. 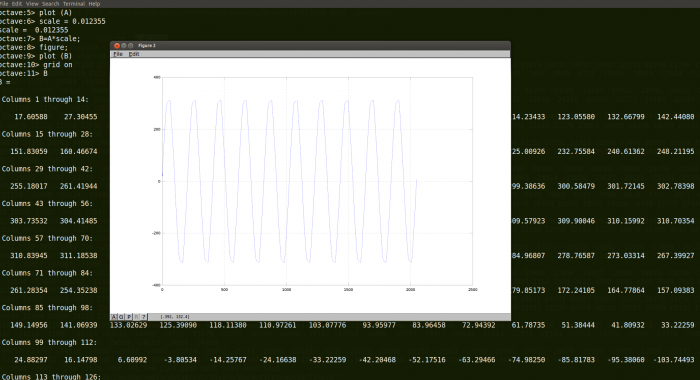 The libraries functionality allows to calculate the frequency, effective voltage, harmonics, and phase shift, from the signal samples in an efficient way. We provide this library as binary blob, since it is basically not open sourced (yet), and originated from the manufacturer himself. Now it is ported for LEDE, and can be used for our purposes. For the provisioning of the calculated parameters, we intend to implement a luci app that shows the calculated parameters. Integration with the power quality library. More updates in the upcoming weeks. During the community bonding period I started working on the code of Quynh Nguyen’s M.Sc. Thesis. She wrote a C++ program capable of calculating the BC of every node of a topology . I re-factored the code, and now it is a C/C++ shared Library . I’ve also applied some OOP principles (Single responsibility and inheritance) and unit tests to make it more maintainable. The interface of the library Is well defined and it can be re-used to implement another library to perform the same tasks (parsing the json and calculating the BC). After I completed the library a started working on the main part of the project. the daemon. We decided to call it Prince in memory of the Popstar. This daemon connect to the routing protocol using the specific plugin (see below), calculate the BC using graph-parser, computes the timers and then it push them back using again the specific plugin. With this architecture it can be used with any routing protocol.I wrote the specific plugin for OONF and OLSRd. At the moment it has been tested with both, but I need to write a plugin for OLSRd to change the timers at runtime. For OONF I used the RemoteControl Plugin. With these feature Prince is capable of pulling the topology, calculate the BC and Timers and push them back to the routing protocol daemon. I wrote a very simple reader for a configuration file. Using the configuration file the user can specify: routing protocol host and port, routing protocol (olsr/oonf), heuristic, (un)weighted graphs. As you can see from this Issue , I’m going to use INI instead of this home-made format. As I said before I moved to a specific plugin all the protocol specific methods (pulling the topology and pushing the timers), to keep the daemon light I decided to load this plugin dynamically at runtime. So if you specify “olsr” in the configuration file just the OLSRd specific plugin will be loaded. Write tests and documentation for Prince. the GSoC is nearing its midterm evaluation, so let’s have a look at the current state of the “Experimental Configuration Environment” (working title)! Make something use ECE! UCI is well-integrated in OpenWrt/LEDE and can be used from C, Lua and shell scripts; all of these languages should also be supported by an ECE client library. An example schema to replace /etc/config/system does already exist and could be used to experiment with partially replacing UCI with ECE. Support schema upgrades: When schemas are updated, this can partially invalidate config diffs. A way to deal with such inconsistencies must be defined. Discussions and feedback have also led me to the decision to put a stronger focus to UCI interoperability. While I had only planned import and export of UCI configuration at first, I’ve realized that a two-way binding between UCI and ECE (i.e. an API-compatible libuci replacement/extension that will use ECE as backend) will be necessary for ECE to find acceptance. This will also allow to continue to use existing configuration tools like LuCI with UCI configuration converted to ECE. Now we are on the midterm evaluation. I would like to tell you what I have done so far and what will come next. In the first post  I explained the work packages. In this post I will come back to the work packages and show you what I have done for each package. The first sub-project was the hoodselector. At the beginning of the work period I did some bugfixing for the hoodselector so that we where able to deploy the hoodselector in our live environment. The hoodselector creates decentralized, semi automated ISO OSI layer 2 network segmentations. You can find a detailed discription here . Retrospective I can say that the deploymend of the hoodsystem went without any major problems opposed to my first expectations. Currently we have 4 hoods active. Around Oldenburg(Oldb), Ibbenbüren, Osnabrück and Friesland. More hoods will follow in future. Open Issues can be find here . The second sub-project was to create a propper workaround for building images with the continuous-integration (CI) system of Gitlab using make on multiple cores. The Freifunk Nordwest firmware now has automatically built testing images that are not only build on a single core but can be built on multiple cores. And the architecture targets are also autogenerated out of the sourcecode. This makes it possible to generate images dynamically for all targets also including new targets that may come in the future. I implemented a small algorithm that manages the thread counter of make commands. I use the number of CPUs out of /proc/cpuinfo * 2 this means for each logic core will follow two threads. In example our runner02.ffnw.de server has 8 cores so the CI build process will automatically build with 16 Threads . Here is an example of a passed buildprocess with our CI builder. Actually it is not possible to build images with a high verbose output, because the CI logfiles will get to big. That makes it impossible to use the webfrontend for analyzing the buildprocesses. I opened an issues for this and discussed the problem with the gitlab developers . The CI builder is very helpful for the developing process of the monitoring drone. Following I would like to report about our first hacking seminar. The first hacking seminar was on 28.05.2016. We started with two presentations. One about Wireless Geo Location and the second one about the Hoodselector. We recorded the presentation with our new recording equipment  bought using some of the money for the mentoring organisation and uploaded the recordings to youtube . The first presentation was about geolocating with wireles technologies. After this two presentations we had a smal disscussion about the presentation topics and than we started our hacking session where the developers started coding on their projects. Now all sub-Projects are finnisched and I will continue with the Monitoring Drone Project after I finish my Study exams. Also the date of next hacking seminar is set for 9th of Juli 2016. Again we will have two presentations. One on Gitlab CI and one about how to use our new Puppet Git repositories including the submodule feature. The presentations will be recorded and after the presentation we will have a coding session like last time. 1. Presentation about workaround with git CI processes. here are some updates regarding DynaPoint. The idea was to create a daemon, which regularily checks the Internet connection and changes the used access point depending on the result. That way the handling with APs would become easier as you already could tell the status by the AP’s SSID. A daemon with basic functionality is already working. After installation, there is one configuration step necessary. 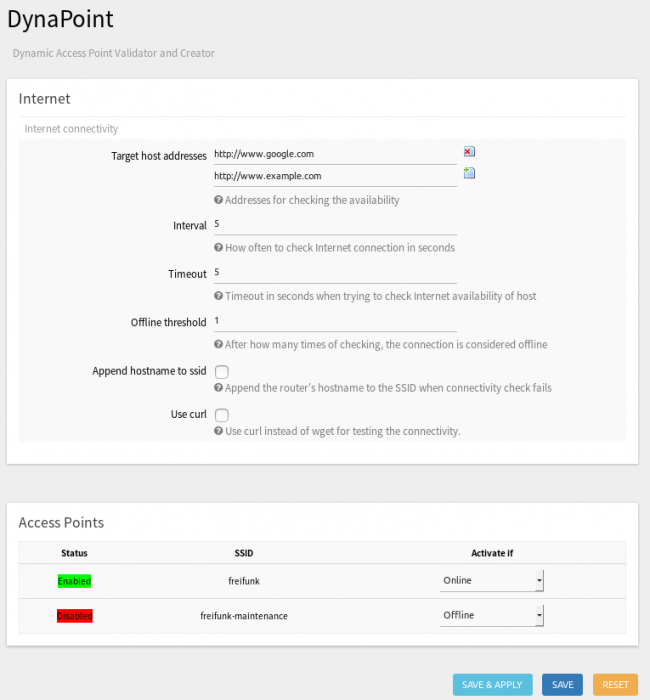 You have to choose in /etc/config/wireless which AP should be used, if Internet connectivity is available and which one if the connectivity is lost. You can do that by adding “dynapoint 1” or “dynapoint 0” to the respecive wifi-iface section. You can also configure dynapoint via LuCI, although it’s not yet complete. To verify Internet connectivity, it is probably better to make a small http download than just ping an IP address. Using “wget –spider” should be suitable for that. Also, I will see if I can get rid of the required configuration step in /etc/config/wireless in the next weeks and provide fully automatic configuration. If you want to test dynapoint for yourself, just go to https://github.com/thuehn/dynapoint.